Exciting Triple Crown 3yo’s Redzel and Gold Symphony return to the track at Canterbury on Saturday in the July Sprint. The Snowden trained pair both trialled well at Randwick on Friday in preparation for their first up runs with Gold Symphony narrowly winning. Redzel (by Snitzel) returns from a four month break following his 5th place effort in the Gosford Guineas at Listed level. 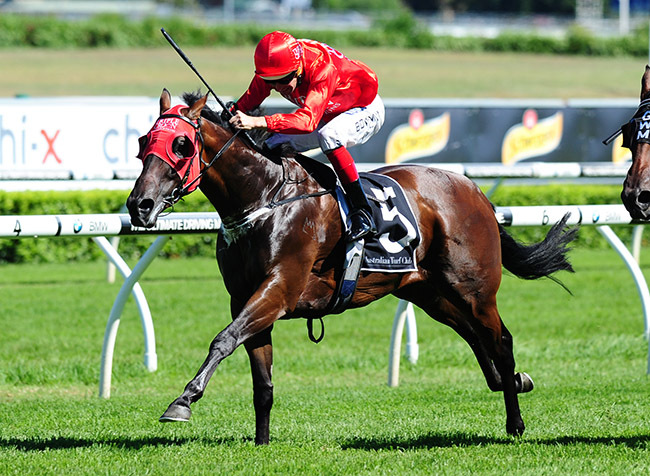 Redzel has had two barrier trials in preparation for his first up assignment winning at Warwick Farm and then following home Triple Crown stablemate Gold Symphony on Friday. Top leading jockey Kerrin McEvoy has been booked for the ride. Fellow Triple Crown runner Gold Symphony (by Reward For Effort) is first up for Snowden Racing after being transferred from the Peter Moody stables in February. Gold Symphony was the winner of the Group 3 H.D.F McNeil Stakes at Caulfield in 2015 and Friday’s trial indicates that he will have no problems with the Sydney way of going. Inform young jockey Sam Clipperton has been booked for the ride. “Both horses have trialled well and look winning chances on Saturday,” commented Chris Ward. With no immediate plans decided until after Saturdays race, Triple Crown are looking forward to seeing a strong performance from both runners and aim for feature black type races later in the preparation. Triple Crown runners are one-two in early betting markets, which highlights their strong form from last preparations and solid barrier trials. Following the abandonment of Warwick Farm races on Wednesday Triple Crown and Snowden Racing are looking forward to a big Saturday at Canterbury. The July Sprint will be run at Canterbury at 3:20pm on Saturday.